The Verbenaceae are a family of flowering plants that are most speciose in tropical areas. Some species are popular garden plants, such as Verbena officinalis (vervain) and Lantana camara, and have become established invasives outside their native ranges. Some taxa previously included in Verbenaceae are now placed in the Lamiaceae as members of the subfamilies Chloanthoideae and Ajugoideae. Species of Newcastlia and Dicrastylis have indehiscent fruits (Black & Robertson 1965); Verbena, Phyla, Aloysia and Lantana have dry fruits dehiscing into two or four nutlets (Hickman 1993). 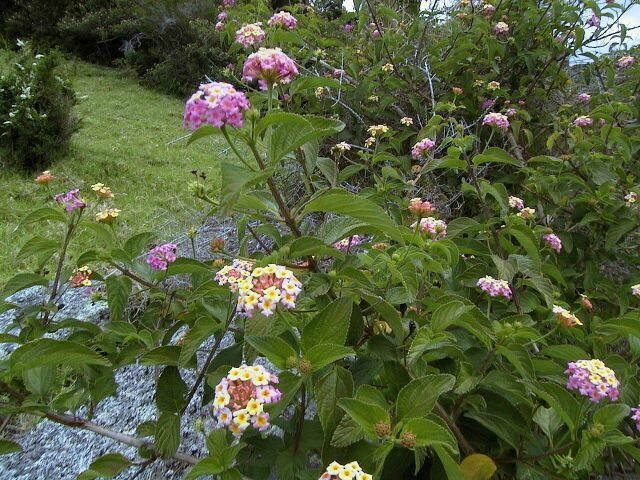 Lantana and Aloysia are strong-smelling perennials or shrubs (Hickman 1993). Characters (from Black & Robertson 1965): Herbs, trees or shrubs; leaves without stipules, opposite, alternate or whorled. Flowers usually sessile or subsessile, bisexual, irregular or almost regular; calyx with 4 or 5, rarely 6, lobes or teeth, persistent; corolla with cylindrical tube and limb (rarely two-lipped) of 4-6 imbricate lobes; stamens inserted in corolla tube, 4 in pairs or 4-6 alternate with lobes; anthers 2-celled, cells usually parallel; ovary superior, originally of two carpels, entire or shortly four-lobed, often seated on small disk, usually four-celled by intrusion of two secondary dissepiments, with one ovule in each cell; placentas axile; style rising from summit of ovary, usually more or less two-lobed; fruit dry or drupaceous, generally enclosed in calyx, indehiscent or separating septicidally into two or four nutlets or fruitlets; seeds one in each cell, or fewer by abortion; albumen scanty or absent; embryo straight, with an inferior radicle shorter than the thick cotyledons. [C78] Clunie, N. M. U. 1978. The vegetation. In: Womersley, J. S. (ed.) Handbooks of the Flora of Papua New Guinea vol. 1 pp. 1–11. Melbourne University Press: Carlton South (Australia). [JS87] Judd, W. S., & J. D. Skean, Jr. 1987. Three new angiosperms from Parc National Pic Macaya, Massif de la Hotte, Haiti. Bulletin of the Florida State Museum—Biological Sciences 32 (1): 137–150. [LC02] Långström, E., & M. W. Chase. 2002. Tribes of Boraginoideae (Boraginaceae) and placement of Antiphytum, Echiochilon, Ogastemma and Sericostoma: a phylogenetic analysis based on atpB plastid DNA sequence data. Plant Systematics and Evolution 234: 137–153. [MP00] Machado, G., & M. A. Pizo. 2000. The use of fruits by the neotropical harvestman Neosadocus variabilis (Opiliones, Laniatores, Gonyleptidae). Journal of Arachnology 28: 357–360. [M01] Morishita, M. 2001. Movement of the two-spotted spider mite Tetranychus urticae Koch and the Kanzawa spider mite T. kanzawai Kishida (Acari: Tetranychidae) in a watermelon-pea cropping system. In: Halliday, R. B., D. E. Walter, H. C. Proctor, R. A. Norton & M. J. Colloff (eds) Acarology: Proceedings of the 10th International Congress pp. 355–360. CSIRO Publishing: Melbourne. [OA02] Ochoa, J. A., & L. E. Acosta. 2002. Orobothriurus atiquipa, a new bothriurid species (Scorpiones) from Lomas in southern Peru. Journal of Arachnology 30: 98–103. [OB11] Orenstein, R. I., & D. Brewer. 2011. Family Cardinalidae (cardinals). In: Hoyo, J. del, A. Elliott & D. A. Christie (eds) Handbook of the Birds of the World vol. 16. Tanagers to New World Blackbirds pp. 330–427. Lynx Edicions: Barcelona.